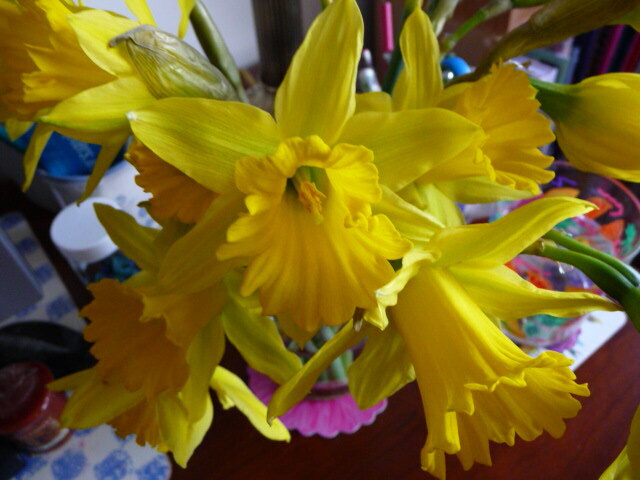 I'm daffodil happy today. I bought a couple of tightly furled bunches yesterday, and I expected them to open over the next couple of days. To my utter delight they wasted no time, and when I came into the living room this morning, they were waiting for me, in full bloom! I can only imagine what Mr. Wordsworth must have felt that day he saw a host of golden daffodils dancing in the breeze. 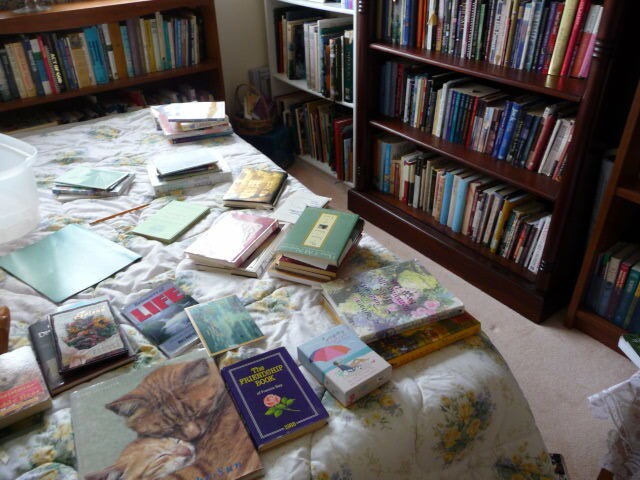 I've been cleaning my bookshelves this morning. 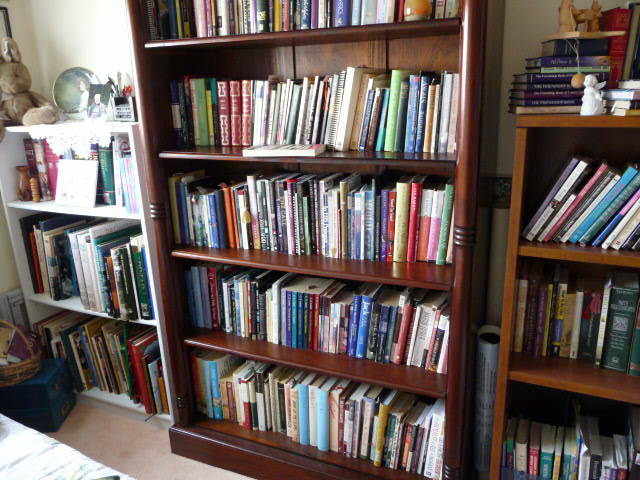 I keep telling myself that I've got to start culling out; there's no more room on the shelves. But that girl must be tone deaf when it comes to books. And besides, every book on those shelves has treasure in it; the ones I didn't find any treasures, well, they are already out the door. So, I'm squishing and squeezing. Hope this treatment doesn't make their spines hurt. And now, I see by my clock, it's time to leave books and daffodils; in a while I'm setting forth on an afternoon outing with a special friend to the Home and Garden Show. wow, you do have a lot of books...amazing row after row and that's just one room-your bedroom. lol! Enjoy the home and garden show, I was suppose to go as well but my friend just cancelled so I will have to wait until next year. I so love your bookshelves!! I'm sure that I can find ton of beauties in there! Just stopped by and made a note to come back again soon. It's lovely. I like all your whimsical pictures! And, p.s. could you please remove my "Scrolls of Clay" link from the inscribe blog roll? Thanks. It's been unactive for a year or two. haha. I am planning on starting a new one in the next little while. I love your blog and I'll be back to visit again soon. Could you please remove the link "Scrolls of Clay" from the inscribe blog? It's my inactive blog. Thanks, I'll be creating a new blog in the near future. Which reminds me...I need to clean my shelves, too. Think I'll get my maid (daughter) to do it next week. :) I only call her 'maid' because I pay her. Tulsa always had a large home and garden show when we lived there. Wish there were one close to us now. So much fun! Love the daffodils. They are so bright and cheery! I can see now why you have lots of selection in your read your own book challenges!